I was just 24 years old when we met. I was single and had my own apartment in St. Louis' historic Dogtown area and wasn't so sure I wanted to share my one bedroom with anyone else. I'd left the Caribbean ship life with Carnival Cruise Lines the year before and was still adjusting to "The Office" life at the corporate headquarters of Charter Communications. However, my mom thought it was a good idea and after months of nagging, I finally conceded. It was a crisp Saturday morning in November and I admit, I was a little nervous about the set-up. When we arrived, mom and I were greeted by a team of specialists who grilled me about the step I was taking and put me through an intense interview. Although I did not have any previous experience, I assured them that I would take the job seriously and was ready to commit...to becoming a cat owner. As I peered through the cages, my eyes immediately zoned in on a cream tabby, who acted as if he were king of the joint. He was sprawled out in the middle of the enclosure with his eyes half closed as an entourage of feline attendants primped and cleaned him. "He's the one!" I pointed as I called my mom over. While I filled out papers, the folks from the adoption center seemed a little bit worried that "Sunny" whom I later renamed Bailey, would be the only feline in my home. Well, as it turned out, my new roomie did not do well living alone during the day time hours when I was at work. Within a week I was calling the Cat Network to inquire whether they had another cat that would be a good match for mine. The woman on the other line happily informed me that indeed they did...and he was Bailey's brother. Apparently, the two boys had been found in a dumpster at just 3 or 4 days old. They were flea and worm-ridden and in really bad shape. A foster mom dropper-fed the scrawny two and took care of them until they were four months old. I was eager to reunite the boys and that evening drove 45 minutes to St. Charles with Bailey in tow. The foster mom let us in and the moment I opened Bailey's cage, Sunshine ran up to his brother and it was a Simba and Nala-like reunion with the two of them rolling and falling down over each other. "Yep, I'll take him," I said. 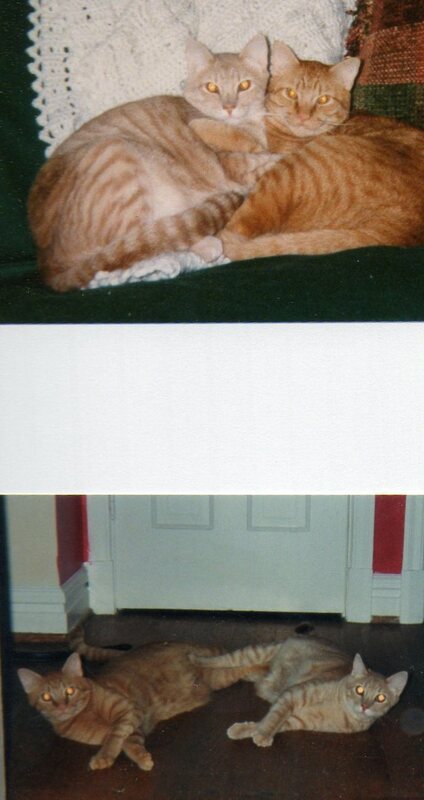 I renamed "Sunshine" Tigger because he was an orange tabby and a little jumpy. He bounded around the house like he had springs in his tail. Over the next few months, my sleep was often interrupted because the two of them liked to begin their games of chase at 2 a.m. and their favorite spot to play was in the middle of my bed. 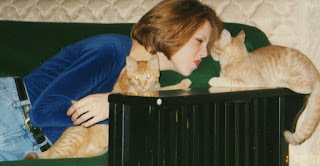 When I shared my woes of sleep deprivation with a vet, he only chuckled and said, "Cats are nocturnal and you have two! They'll settle down eventually, but kittens have a lot of energy." I tried phoning them at home several times a day in hopes that the telephone ringing would rouse them from their daytime cat napping and turn them into better night time sleepers. No dice. Each evening they greeted me at the door ready to be fed. However, one night I returned home later than usual and the boys uncharacteristically did not welcome me at the door. Instead, they lay dozing on the futon, seemingly content. It wasn't until I turned on the light that I spied two, empty packets of cat food. The pawtners-in-crime had somehow figured out how to get into the kitchen pantry and had climbed several shelves to reach the booty I thought I had stored so well. The boys proved to be more dog-like than I would have thought possible. While Tigger liked to play fetch with milk rings, Bailey would beg on command. He was happy to raise up on his hind legs and wave his front paws over his head to earn a prize of a milk-dunked Cheerio. Both responded to my whistle and whether indoors or out, would come out of any hiding place to find me. In the early years, the two kept me from freezing during the winter months of living in that decrepit apartment. At bedtime, I'd whistle and the two would immediately jump on the bed and get into their respective places. Tigger would head to the bottom of the bed and spend the night curled behind my legs while Bailey preferred to act as a furry hat atop my head. They were inseparable. During the day, my little bookends preferred to sleep among my thick bed of daylillies or worked in tandem to catch birds and rabbits. Each night they crammed together to rest in a single laundry basket. Three years ago we lost Bailey (also known as Heavy B because he tipped the scales at 18 lbs.) when a hawk attacked him in our own backyard. It was a shock for all of us, especially Tigger. Today, I had to say good-bye to Tigger, and it was so stinking tough. He has been a constant in my life for 16 years...a furry companion who silently sat with me when I cried over a break-up or worried how I'd make rent. He and Bailey were my "test babies" before Steve and brought home our own two from the hospital. Tonight the house seems too quiet. I already miss Tigger's extensive vocabulary of yowls and whines that only I seemed to be able to understand. Rest in Peace Tiggie Wiggie. Two weeks after I got them. A life lesson I wish they didn't have to learn. Gut wrenching. Poor babies. Hugs for you all! I know it's part of the deal, we get them to love for only so many years, but it never seems long enough. I'm thinking of you and your family during this sad time. These are such striking photos though. Especially the one taken two weeks after you got the kitties. im sorry to hear that my cat is my heart and if be so devastated. I'm sure he lived a happy life it certainly seems so in the photos.